Why enrolling in our school? With talent and skills, anybody can design a kitchen! And you can learn about it by browsing hundreds of DYI websites and brochures dedicated to that. But when designing kitchens becomes a day by day job that requires professionalism, customer relationship, efficiency, etc. self teaching is not sufficient. There are specific information about ergonomics, work flow, aesthetics, to be delivered in a proper format in the right amount, and only a school can give these to you, left aside the fact you will be exchanging thoughts with long standing kitchen design professionals. 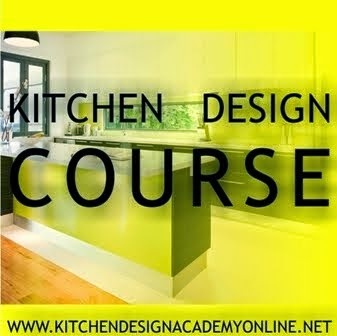 And this is what we do at Kitchen Design Academy, we help passionate people up skill in kitchen design, so they can do well in their jobs! We offer 30% off from the enrollment fees for the rest of the year. Never too late to enroll, there two more starting dates : 7th of October and 4th of November. Ask here for an enrollment form. 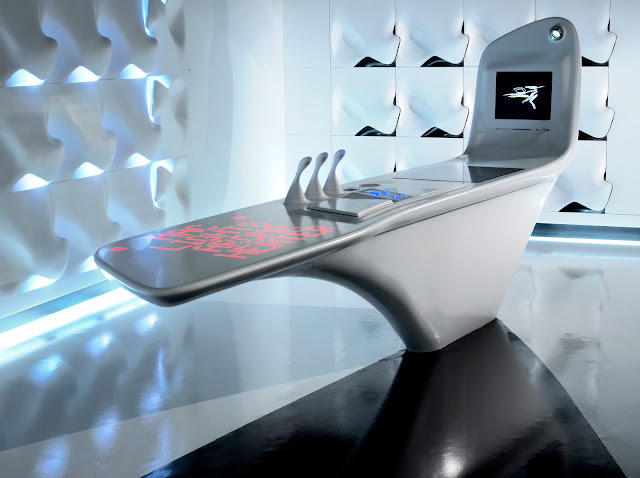 Zaha Hadid consistently pushes forward the boundaries of architecture, urbanism and design. In her work she performs experiments with new spatial concepts, experiments which have intensified existing urban landscapes in search of a visionary aesthetic that encompasses all fields of design, from the urban scale to the design of products, interiors and furniture. Hadid studied at the Architectural Association where she was awarded the Diploma Prize in 1977. She has become partner of the Office for Metropolitan Architecture and has been a lecturer at the Architectural Association until 1987. Zaha Hadid has held the Kenzo Tange Chair at Harvard and was a visiting professor at Yale thanks to Eero Saarinen Visiting Professorship. Zaha Hadid continues to remain the most distinguished visiting professor at the University of Applied Arts in Vienna. She is an honorary member of the American Academy of Arts and Letters, won the Pritzker Prize (2004), is a Fellow of the American Institute of Architecture and Commander of the British Empire. Zaha Hadid has also received the Austrian Decoration of Science and Art and is a member of the Royal Academy of Arts in London. Gold Medal Architectural Design, British Architecture (1982) for the project at 59 Eaton Place, London. Mies van der Rohe Award (2003); AIA UK Chapter Award (2002); special mention Equerre d'Argent (2001) for the design of the Car Park and Terminus Hoenheim North, Strasbourg. Austrian State Architecture Prize (2002); Tyrolean Architecture Award, 2002; gold medal for design (2005) granted by the International Olympic Committee for the trampoline Berg Isel ski jump, Innsbruck. Deutsche Architektur Prize, Building of the Year (2005); European Commercial Building and RIBA Stirling Prize Finalist (2005) for the BMW headquarters. "Z.Island" is not simply a project created in order to astonish people and make them talk. The kitchen area conceived by architect Zaha Hadid in collaboration with Ernestomeda and DuPont brings with it concrete innovations that will be useful for future production and that involve the processing of the materials, the structural organisation and the integration of advanced technologies. 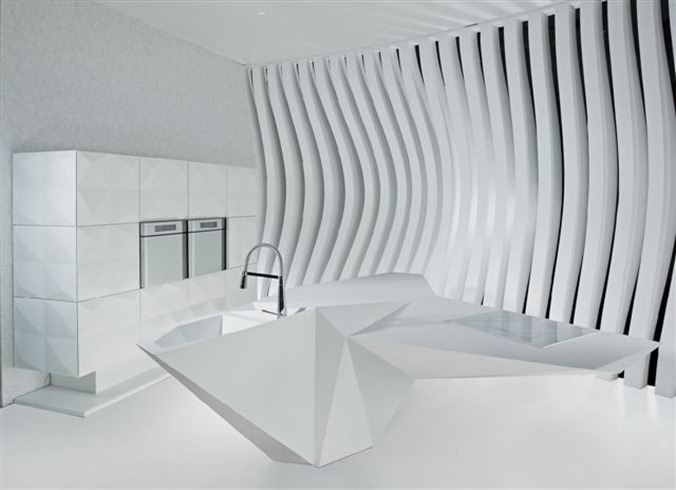 Malleable materials, fluid environment Corian®, the raw material used for the creation, is an exceptionally malleable element that is perfect for meeting the creative requirements of an architect renowned for the complexity of her designs. 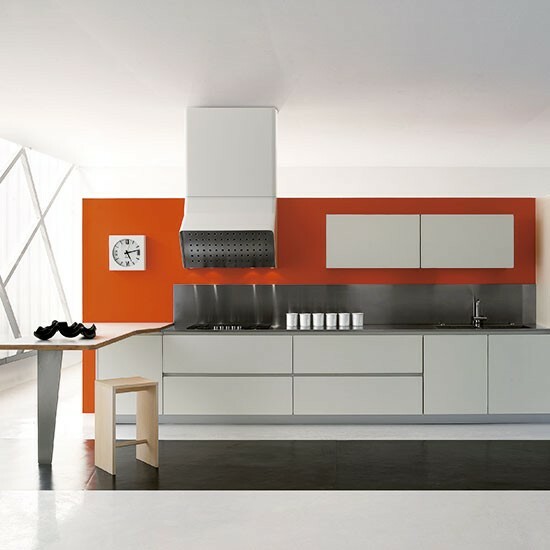 No longer restricted to isolated elements, such as the worktops or sinks, Corian® has now been used to create an entire kitchen structure (split into two blocks, which are at the same time functional, compact and sleek) and an extensive modular range of cupboards and panelling. The surface is translucent, smooth and fluid, and is as pleasant to look at as it is to touch. 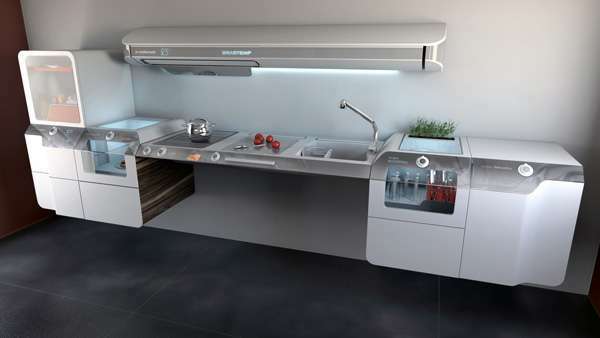 The cooking island (with hob and hotplate) is extended and curves along the right hand edge; the washing island (with sink, draining area and completely hidden built-in dishwasher) is hexagonal and compact. The horizontal surface of the former is provided with a scrolling LED script, while there is also a spotlight, an LCD screen and, slightly lower down, an mp3 player, two USB ports and a CD or DVD player. The central working area houses an induction hob, a food preparation area and a hotplate built into the Corian®worktop. Finally, from here it is possible to release special fragrances through three aromatic scent dispensers to permeate throughout the entire kitchen area. Complementary wall-mounted cupboards and wall panelling are available: the former made using shaped wavy doors in Corian®, set into an aluminium frame. The wall panels, instead, (alternate flat and shaped Corian® surfaces produced by means of a heat-shaping system) incorporate an advanced sound system and sophisticated LED panel: thus each panel becomes an original source of sounds, music and coloured lights that can filter through the material in the desired sequence. Now, sensorial involvement is complete: whoever is doing the cooking can, if they so wish, navigate on the web, download e-mail, watch a film or set up a programme of songs to listen to. Not only: by the use of lighting sequences and the measured release of aromatic essences appropriate for the occasion, it is possible to create fascinating and customized environmental effects. 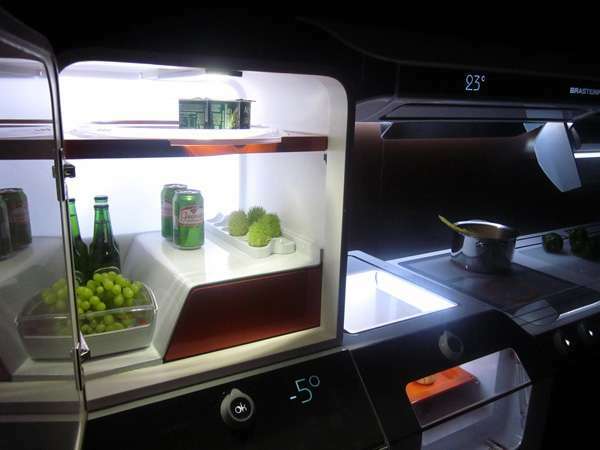 All the programming is done through a control panel, of the "touch control" type, situated at the centre of the “cooking” area (lit by blue LEDs), from where it is simple to access the kitchen’s multitude of functions. 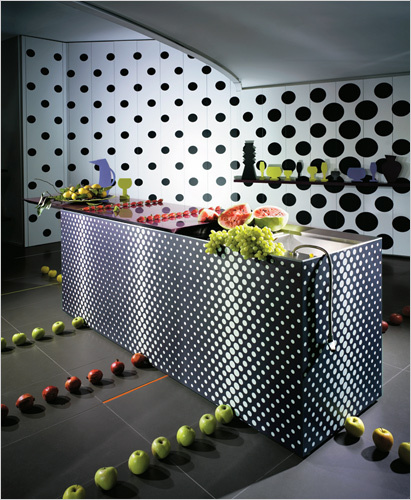 In 2006 "Z.Island" kitchen has been at the New York Guggenheim Museum’s monographic hall dedicated to the work of Zaha Hadid. In this prestigious venue this extraordinary project has found an ideal exhibition context amongst magnificent paintings, adventurous designs, photos and furnishings that bear testimony of and illustrate the visionary world of this, the only woman ever to have been awarded the Pritzker Prize for architecture. In the crowded scene of domestic design, Lago takes its place as an emerging brand through exciting products and a corporate contamination between art and business, combined with the search for sustainable development. Our values ​​are: quality of life, being together regaining possession of the house who returns home environment and not just a place of transit, through the influences provided by the people who live it every day and can enrich it with a high quality design at a fair price. An establishment designed as a house, the man who returns to the center of the company which inevitably reappears in the center of the area and promotes intelligence with the economic and cultural development. Why is the man who creates the man who uses it. A study that is home to university students and designers from around the world: creativity, friendships and influences that enrich the mind and the work of every day, flow together in our products. Tangram, Static, Net, 36e8, float, 30mm, lockers NOW and new kitchens have now become true icons of the production, from the market and appreciated by critics. In 2006, the company has become Spa, joining the family business with a major restructuring of production and management processes, which is essential to address and manage the more than positive trend of growth and face the difficult challenges of international markets.The company's revenue today nearly 30 MILLION Euros, with about 150 employees, 25% of which were made in 2008. A 'major distribution plan is driving the opening of new stores across Europe, forming partnerships with major retailers. Today it is necessary to say that a company is attentive to the needs of its consumers, then we try to go beyond mere listening, turning it into dialogue and discussion through the study of how to enrich and engage the consumer in the experience of improving their living by furnishing the own home. In this sphere within the blog "Design Conversation", the first Italian corporate blog. 36e8, with the Lago in the kitchen you breathe! The kitchen is part of our collective imagination, has an evocative power that no other room in the house has. It is the heart of the house, the very essence of conviviality. It's where we weave relationships, exchange feelings, share life in a word. Real or imagined. Yet all too often is relegated to anonymous area of ​​food preparation, hidden, when it should occupy areas bright and sunny, be well in sight. By Lago a project that alleviates the perception of space and full kitchens seen so far. The containers can be positioned horizontally or vertically and can be combined in infinite ways on a hypothetical grid (36.8 cmX36, 8cm and 18.4 cmX18, 4cm) which allows freedom of composition, creativity and proportion. Home environments, often overworked-performance technological objects, Lago returns love, harmony and warmth. Innovation semiotics of the "fourth dimension", although appealing, guarantees excellent responses in terms of practicality and functionality without forgetting that the primary function remains Cook. By Lago the kitchen is a subject and not just an object of furniture. 1) Lightness not as trivial subtraction of elements, but as a reaction to the decorum order to itself. 2) Suspension of volumes to the wall or room Centre. 3) Thin top, almost imperceptible becoming one with the volumes of bases. 4) Doors and essential with pure lines, without handles big baskets, which opens with a twist. 5) Kitchen wall units sliding along the walls engulfing appliances. In the kitchen you can breathe! 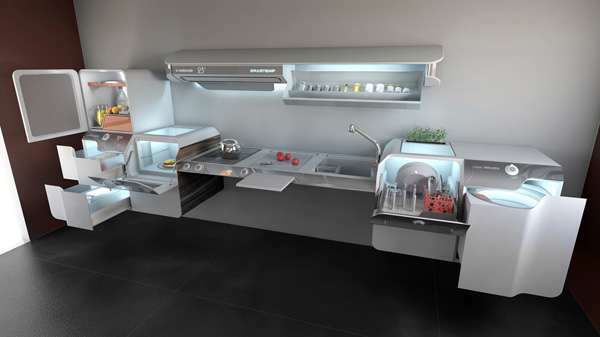 The project 36e8 ® Kitchen on the awareness that the design should be designed for humans as a whole is responding to emotional aspects, but also, above all, functional. It is the design that must be at the service of man and not viceversa. So we've tried to improve some kitchen's ergonomic aspects (seen up to now), trying to evolve the interaction between man and object, needs and responses. With extensive 36e8 ® modular kitchen has endless possibilities for compositions that allow for their inclusion in any kind of space. The junction 45 and the internal and external coating allows the roof to put in any position. Both the base and wall units can be positioned according to the millimeter so precisely the ergonomic measures. 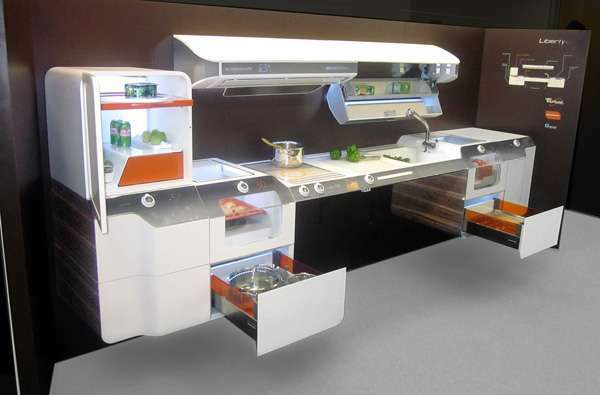 36e8 ® Kitchen can be completely suspended. The suspension allows for a major cleanup of the environment and food, and do not hinder the diffusion of heat in case of floor heating. Three different depth allow you to customize the working top by adapting to user needs, the size of the room and the kitchen itself. Ergonomic solutions for home appliances at last. The 36e8 ® dishwasher into suspended bases. This solution is much more ergonomic classic dish on the ground and can reach the basket without the need to bow. Oven and microwave are placed inside the columns to allow use of a simple, immediate and above all ergonomic. The oven can also be seen hanging in the bases and then placed at a height more accessible. The Fresh fridge, then, is a real piece of furniture that breaks away from the mere function of food preservation, thanks to body glass over each of the three sides that can be customized with any color of Lago range. The Liberty Project Kitchen Concept is purely focused on function. But, thankfully, since it prides itself on streamlined simplicity, a pleasing aesthetic becomes a natural extension. This modular system integrates and aligns everything that a homeowner would need in a kitchen, including, but not limited to a refrigerator, cooking area, washing area, water recycling system and exhaust. All of these segments are also height adjustable for every individual, as well as the disabled. Designed by Helder Filipov and Whirlpool Latin America's Advanced Design Team, the Liberty Project Kitchen Concept may be simple in looks and function, but since it can be arranged and re-arranged, people can customize it to suit their individual needs and wants. When an architect and interior designer work together on a new home project right from the start, you can be assured every detail will be fine-tuned leaving nothing to chance, including the kitchen design. Such was the case for this project. The Lockwood house was designed by architect Jorgen Frandsen of Ambienti Team Architects, with the interior and kitchen design by Irene James of James Trent Design – both Tauranga-based companies. James says she worked very closely with the owners on the interior. "The home has an idyllic waterfront location, which impacted on the kitchen design, just as much as it did on the rest of the architecture," she says. "It was essential that the kitchen be an integral part of the overall design, so that it would not detract from the view. It needed to blend in effortlessly in terms of the materials and design." For this reason, James specified Rift Melamine cabinets with an understated woodgrain finish for the island, and a shelving unit and countertop to one side. "This is a perfect complement to the blonded timber walls," the designer says. "At the same time, however, because there is so much wood in the house, we wanted to include something different. Soft White Melamine cabinets with stainless steel benchtops provide contrast on the rear wall and give this part of the kitchen a slightly industrial look." Stainless steel is also on the custom rangehood that conceals a powerpack ventilation unit, on the toekicks and on a design feature on top of the island. However, the splashback is in frosted glass – a deliberate play on the changing light that occurs with the estuary tides and at different times of the day. "The frosted glass reflects the light in the same way, and lets the grain of the timber walls show through," says James. "The essential nature of the Lockwood interior is never compromised." The designer says because the owners love to cook and entertain, the kitchen needed to be highly functional with plenty of storage right where it is needed. "We added an aluminium appliance cupboard to conceal the small appliances and other items they needed to have close at hand. It keeps the clutter hidden." James says although it seems simple, there is a wealth of detailing in the kitchen. A work counter in front of the window features concealed drawers with 45° arris corners, for example. Rift Melamine on the sides of the island wraps around the base to enclose the unit. 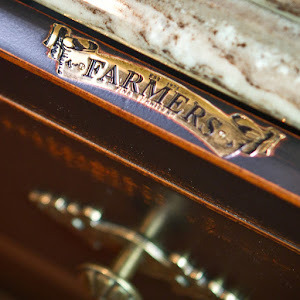 And drawers include wooden liners for cutlery – all simple touches that add a touch of refinement. With expertise spanning two centuries, diverse industries and more than 90 countries, DuPont is uniquely positioned to help solve some of the world’s biggest challenges. 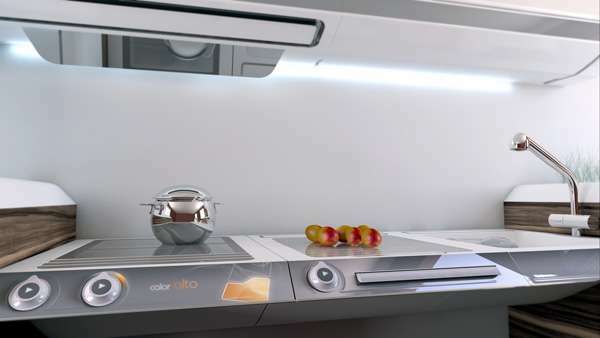 For the sleek and contemporary look of a gally kitchen, the use of colour combination and the choice of the rangehood. Great for a studio shot, eye catching for an ad, not really designed for cooking. Than what is it?